Whats the most fundamental skill a martial artist must develop? The skill that is a common thread regardless of the individuals style or syetem? It’s what makes the master seem untouchable. It’s why the novice is so unpredictable. It’s the difference between effortlesly beating an opponent and being in a fight. What is this great skill? At some point in out martial arts career we’ve al thought that we were a bit tasty and really put it up to our superiors in a sparring session. More often than not we were put straight back in our box. But if your coach is twice your age and half your size, how is it is seemingly untouchable and able to pick you off at will? It’s his sense of timing, his ability to read the situation and move only as much as he needs and no more. At Wild Geese, we’re all about effeciencey. You cannot be effecient without good timing. By learning to flow with a training partner. Free play and sparring are the keys to developing a keen sense of timing. Learning to move as he moves, when to exploit he openings and offering up your “openings” as a trap. The Filipino’s use many such drills, as do Tai Chi, Wing Chun and many of the Chinese styles. BJJ players will also spend time “rolling” which is the same thing. Playing with the training partner with a predetermined level of resistance, attempting to apply various techniques while not falling victim to your opponents. At first there should be complete cooperation between the partners so that a basic level of skill may be accomplished, then as that skill improves, the resistance should go up in response. The end game is basically free sparring whee anything goes. Although there is absolutely no need to rush to the anything goes stage. A degree of cooperation is necessarry in order to best develop the skills and techniques. All out sparring should be kept for special occaisions. Add some flow into your own training and you will very quiclky see your abilities improve. You won’t have any new techniques bt you will lear when to best apply the techniques you have. It’s how well you know it. As martial artists grow and gain experience they are often looking for the next new piece of info, the newest technique, the next drill. In fact the opposite should be done. Strip away the excess, loose the junk and use the extra time to work on the things that really work. Forget fancy, go for simple. Review the techniques and drills you have, are they of any use? Will they work for you in the real world? It will nearly always the things you learned when you were a white belt. Why do we get taught fancy stuff? Usually to keep students interested, that’s not completely true. Advanced techniques are necessary, but they should build directly on the foundation of the basics, they should be ways of making the basics more effective, not replacing them. If strength and fitness are included in your training (and why wouldn’t they be?) then the problem is compounded further. Just open a muscle magazine or look on youtube for some of the weirdest exercises ever conceived. Things that do nothing more than waste time that could be better spent on more productive endeavours. Stick to the basics. Get results. End of. PS Don’t forget, No Equipment, No Excuses – Bodyweight training for the home, office or on the road is on special offer for the next two weeks only, get it while it’s cheap!It will show you the best bodyweight only drills to complement your daily life, with progressions from beginner to advanced, with no fancy b*ll*cks. We’re delighted to announce that we have new instructors and new classes at the Academy. For a full overview of the class schedule go over to www.wildgeesma.com. Ever watch the discovery channel? How about David Attenborough shows? Do you notice how the predators always pick out the weakest in the heard and focus all of their attacking focus and power onto that single individual. People aren’t much different. I have my students play games. I give them homework. I ask them that when they are on their way home, look around them and check out the herd, see if they can pick out the weakest, who would they hunt if they were the predator. The object of the exercise is twofold. On one hand the students are learning what it is that a potential attacker looks for, while on the other it raises their awareness level in order to spot potential threats. By putting themselves into the mind of a hunter, they can see other peoples weaknesses and learn to avoid the same mistakes that they are seeing around them. Plus simply being more aware of those around them makes them instantly less attractive to an attacker. Think about it, two people walking along, identical size, gender dress etc except one has their head down, earphones in and are obviously daydreaming, the other is walking tall and striding confidently. You are looking for an easy target, which of them would you choose? Separate yourself from the herd, don’t be a target. A Reductionist Approach to Fitness? 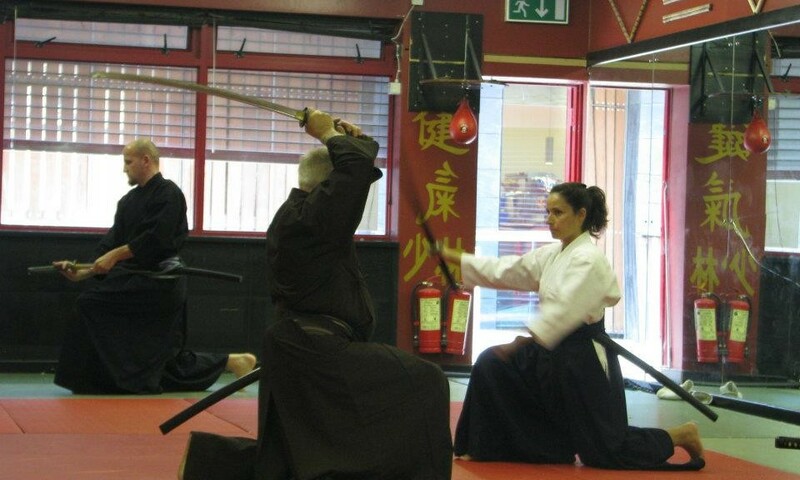 This is a guest post from fellow scotsman, martial artist and trainer Alwyn Cosgrove. Alwyn may have crossed over to the darkside by moving to the politically correct US, but he still doesn’t mind his P’s and Q’s when it comes to talking about the state of the fitness industry. We no longer use the term ‘style’ to describe a fighter — we say “he has good stand-up” or a “good ground game”. Here we are, 35 years later and the martial arts world has embraced that ideology completely. I was just reading a post on the Applied Strength Blog entitled “Contradictions and Situational Correctness”. In it Brett Jones discusses how bogged down people get when discussing training methods. Now while Brett is discussing strength and conditioning, his comments ring true in the world of Martial Arts. I constantly hear students talking about the differences between one style and another, but very rarely will I hear a discussion on the similarities. Take Karate for example, you’re either a Shotokan or WadoRyu man. Are you? They both developed from the same source, have mostly the same kata, same techniques and if you look at the kanji, before it is transliterated into English, the same names. But yet the two camps will not see eye to eye. In the kenpo studio, Ed Parker’s syllabus is lengthy, but if you look at it, most of the techniques are merely variations on earlier ones. Except the counter strike is low instead of high, or you step with the left foot not the right or add this bit off that one to the end of this one. In other words, you explore the possibilities in a structured manner preparing you for the chaos of a real fight. And yet I constantly hear students and some black belt “instructors” saying how each technique is unique and different to all the others. I personally have attended lessons in Wing Chun, Wado Ryu, Shotokan, Tai Chi, Doce Pares Eskrima, Rapid Arnis, Balintawak Eskrima, Shaolin Kempo, Goshin Jitsu, Aikido and a few others. And you know what, it’s all the same stuff done differently. Body mechanics are body mechanics, it’s just one mans preference of how to apply them. Be it the upright Wing Chun or the sweeping circles of Aikido, the hips generate power to either strike or snap an opponent. Take heed of an old mantra “methods are many, principles are few”, look for the underlying principles and forget about whether your fist is held vertically or horizontally, it doesn’t matter if there’s no hip, no focus or your face is being smashed up while you try figure it out. Wild Geese Martial Arts encourage students to think for themselves, whatever they are learning from us. If they are learning eskrima, we’ll show them differing styles of doing the same thing, if it’s kenpo we’ll encourage students to explore outside of the strict syllabus. Sure if you watch Paul and I, we even do things different to each other on an aesthetic front. The end result is the same though. Before I studied the art, a punch to me was just a punch, a kick was just a kick. After I’d studied the art, a punch was no longer a punch, a kick no longer a kick. Now that I understand the art, a punch is just a punch, a kick is just a kick.